The Angry Birds Star Wars app launched last week, to the delight of kids (and parents?) everywhere. Melding together perfectly like the peanut butter and chocolate of the app world, the newest and arguably perhaps the best Angry Birds release will have your li’l Angry Birds fans beaming with joy – and enraptured for hours. The birds are cute, the Star Wars references are cleverly integrated, and the characters are reminiscent of the loveable LEGO franchise video game spin-offs. Angry Birds Star Wars offers 80 levels of Angry Birds decked out in Star Wars character apparel and set against Star Wars backdrops. The game starts on Tatooine, you’ll relive Yoda’s Dagobah and ultimately work through to the Death Star (or should I say “Pig Star?”). There’s a Hoth world currently in development, but each of the current levels bring the iconic Star Wars characters to life (in bird form of course), including a light saber-wielding Luke Skywalker, and blaster-toting Han Solo and Chewbacca. The pigs in this release are dressed as Stormtroopers and Sand People and you get to battle the pig version of Darth Vader. 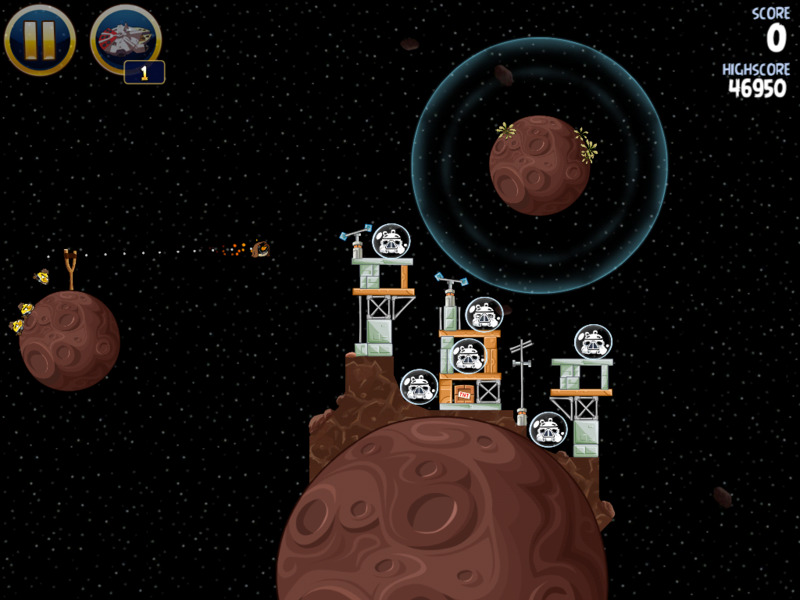 The game play blends the traditional “ground-based” Angry Birds physics that they became famous for, with the space-based “Zero-G” technology that was introduced with Angry Birds Space. But this isn’t a rehash of prior Angry Birds. The fun and the challenge begins with the Star Wars characters – to solve each level correctly, each Angry Bird has different special skills. The yellow “Han Solo” can take out piggie Stormtroopers, but he doesn’t accelerate upon swipe, while in mid-air you need to aim his blaster to take out a piggy Tie Fighter. The normal red “Luke Skywalker” wields a lightsaber in later levels, and “Obi-Wan” uses the Force. This adds to the fun and difficulty of the game. But beware of the Dark Side, as with previous versions of Angry Birds, what used to be the Mighty Eagle, a creature that could level all pigs, has appropriately been replaced by the Mighty (Millennium) Falcon. Getting upwards of 250 Falcons will cost you an additional $19.99. If you want to play this version of the game and rack up medals like the ones given to Han and Luke at the end of the first Star Wars movie and have bragging rights, it will cost you to do it. Angry Birds Star Wars is on track to become one of the most popular apps of all time. They’ve already made the jump to Light Speed, breaking through all previous records by landing in the #1 spot in the US App Store within only two and a half hours of its release according to Rovio. Angry Birds Star Wars is available on most every platform including iTunes for $.99 and an Android download for FREE. 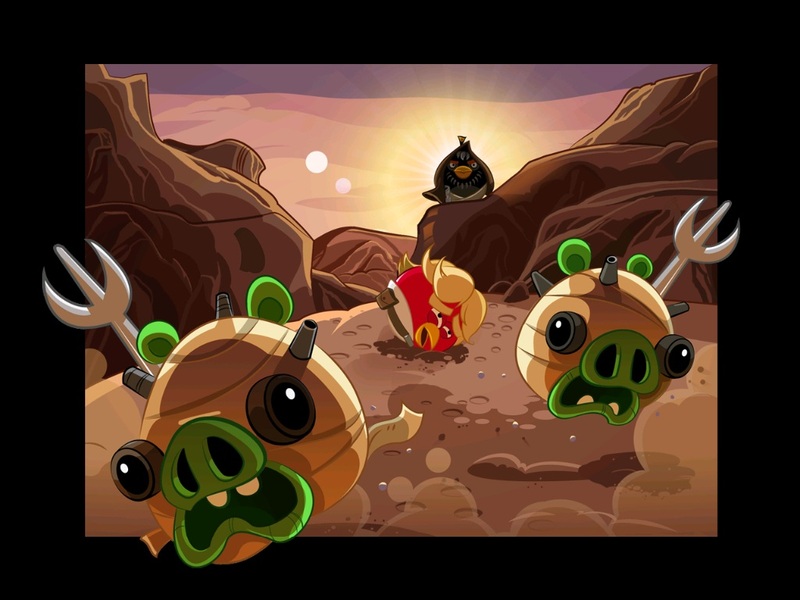 Angry Birds Star Wars is one of the most cleverly integrated blends of two epic brands, spectacularly fusing what’s great about the Angry Birds franchise of sling-shot birds and pigs with the right blend of Star Wars to make it entertaining and not campy. Kids, teens and parents all may enjoy it.